Despite the fact that I didn't get enough sleep due to Buzzer . . . oops, I meant to say because of Skor! Anyway, Skor was determined to wake me up early this morning. I managed to ignore him for a bit but . . . I am feeling pretty chipper this morning. I am listening to Sister Hazel. I have liked this band ever since Hubby and I met the band members on a flight from Ohio to Dallas about 10 years ago or so. At the time neither of us had heard of Sister Hazel. We did a little research and got their album (I can't tell you if it was their first or what). We liked their album. Last night I was talking to my friend Tricia (who spells her name TOTALLY wrong!) and was telling her about the availability of free albums on Amazon. While I was talking I happened to look on Amazon and there was a FREE album by Sister Hazel! I was THRILLED! Needless to say, I downloaded the album. It is what I am listening to right now! Hubby did give me a moment's pause when he said that Al Gore likes Sister Hazel too. I wasn't given pause by the mere fact that it was Al Gore politically - I don't care. My pause was caused by the fact that he is older than I am and maybe I am liking "old person" music! Heaven forbid!! Yesterday I stopped by the book sale put on annually by the school district I used to work for as a teacher. I love this sale. Every paperback is only 75 cents and there are LOTS of books. The sale is in an empty Old Navy store. There are long tables stretching across the space with an aisle in the middle. The books are all organized into different sections like a book store and there are literally millions of books! The only downer is that I forgot my book list - the list of books I have read - so it was hard for me to get books written by any of my favorite authors without being sure that I hadn't read them or not. Because of that, I wandered the aisles and picked up books by authors I had never heard of! That was fun! Also, I have a lot of "serious" books in my stock already - you know, mysteries and things like that. So - when I was at the sale I picked up "light" books. Romances and things like that. To balance out my stock! After giving my new books a thorough sniffing, both cats seemed to approve of my selections! Today is "The Phantom of the Opera" at the Music Hall at Fair Park. I am excited. This will be the second time Hubby and I will have seen the musical and the reviews in the paper have been excellent. Voice Update: My stuffy nose and the drainage is making me a bit raspy in the mornings but other than that . . . doing fine. Yahoo! It is Friday! I have survived another week. Did I mention that my bosses think they have hired a person to replace me? I am so happy I am almost bursting. Yes, I will miss the challenge that working brings each day but now I might be able to spend some more time concentrating on my class (and SUCH a lovely class it is!) and might actually be home when Hubby gets home from work! The potential employree is most likely going to come to the office on Monday to spend some time with me to see how things work and to meet Susan. Speaking of Susan - did I tell you that she cut her finger - badly? Apparently, she is going to have surgery on the finger on Wednesday. She was told that she can't play tennis - her passion in life - for over a month. Needless to say, she isn't happy AT ALL! Today I am going to show you two more pictures I found while roaming through my picture files. This time you get to see my Grandma Denny. Guess who the little girl is! That's right! It is me! 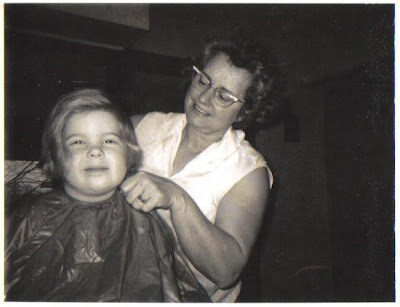 Grandma used to cut my hair in her kitchen. 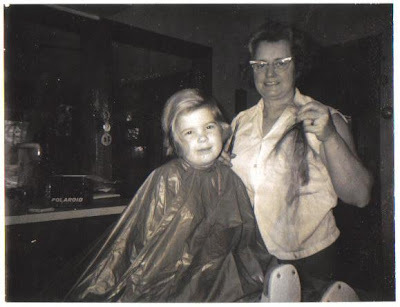 I can't quite remember if I was happy to have my hair cut this time or not but I do remember having her cut my hair. She was a woman who seemed capable of doing everything! As a side note - are those my shoes in the bottom right of that last picture? If so, they are HUGE! I must have been Bigfoot when I was little! Back to Grandma. She was a dairy farmer's wife and could milk a cow with the best of them. Some of my favorite memories of her involved her milking cows and helping out in the barn with her "barn cap" on. Usually the cap had bright polka dots on it. I also remember her making "Grandpa's butter" from the cream from the barn. Once I helped her make apple butter. So many of my memories of Grandma involve cooking in that big, warm kitchen. Or out in the garden weeding the green beans or picking tomatoes! Voice Update: Doing well even though it seems that I have finally succumbed and caught Hubby's cold! Oh well! It is Thursday! I am tired from being out until nearly 11:00 last night (that darn class!) and I have a bit of a headache (probably because I didn't get enough sleep?!?). Mom is wondering why I am not feeling as happy as I felt last Thursday. I can't figure it out either! Oh well! I am just pleased to have survived another class with little harm and with some pleasant interaction with my friends. That is one reason I really keep going to the class that I don't enjoy. My friends are there and I get to see them! In addition to my friends who are actually taking the same class as me, I also have friends in the lab - Deaf friends who have worked with me for the past two and a half years as I struggled to learn the language. They are wonderful people and I miss seeing them more often. When I had class twice a week I would see them more but this once a week deal makes it difficult! Anyway. I was looking at pictures from my old computer and found these. This is my Grandpa Denny. This picture was taken when Grandpa wasn't as healthy as he once was. He was probably in his 80's in this picture. This isn't how I remember Grandpa Denny. I remember Grandpa in his white t-shirt and his overalls just coming in from milking the cows and working in the barn. He would take off his work boots and wash up in the garage where there was a sink for just that purpose. Then he would come into the big, warm kitchen smelling like hay and manure (if you were raised in the country it isn't that bad of a smell!). Grandpa would sit in the rocker in the kitchen and chat with everyone before heading downstairs to take a shower before supper. I loved seeing Grandpa like that. He always seemed so big and strong. He was a hard worker and even as a small child I was proud of that. Seeing him in the barn with the cows or on a tractor in the fields made me feel happy. He was a good, decent, hard-working man. Grandpa might not have been the most educated person in the world but, to me, he was one of the smartest people in the world. I love him and miss him. This is my Grandma Frank. I think I got a lot of my ornery personality from Grandma Frank. She was an amazing woman. Grandma lived on the farm my father was raised on and loved those country roads. She was a speed demon in her car and I always believed that was because she drove the ambulance for the volunteer squad for a number of years. Grandma was also involved in EVERYTHING! She knew everyone and everything that was going on. Grandma enjoyed her gossip. Grandma lived to be 95 years old and her mind was sharp pretty much to the end. One of my favorite memories of Grandma is when I first told her about meeting Hubby. My parents were living out of the country and so Grandma decided that she should ask all the questions a mother should ask her daughter about a man she met. Let me tell you, some of the questions were hilarious! The conversation ended with both of us laughing because Grandma asked if Hubby was an alcoholic kleptomaniac! Grandma always had her own opinion of things and didn't do anything she didn't want to do. She was a strong woman and I miss her. Sorry I didn't get a post up yesterday but I had the chance to sleep in so I grabbed it with both hands and hung on for dear life! This morning - no sleeping in! Last night Hubby and I backed up everything on our computer with our newly arrived Clickfree Automatic Backup. This is the same device we saw on the Home Shopping Channel the day that our old computer blew up. Hubby ordered one and we are attempting to be better about backing stuff up! Anyway - the back up took WAY longer than we thought and that precluded any intentions I had of working on the computer. That means that the two videos I needed to watch and evaluated on the computer didn't get done last night. AND since today is CLASS day (I am certainly NOT excited by that fact!) and I go to work early I don't have the kind of time in the morning that I normally do. That means that I needed to get to work early this morning. Luckily, I have now gotten both videos watched and evaluated. The unlucky part - one of the videos is of myself telling a story in American Sign Language (ASL). It is painful to watch yourself on video. It is even more painful to see all of the mistakes you make when you are trying to interpret something into ASL. I can hardly stand it but . . . I must do it so . . . I must. It is just so darn painful to watch! In other news, my bosses are starting to interview people for my position tonight. Yeah! There might be a light at the end of my work tunnel. Of course, I will probably miss it once I stop working! Hope your day isn't nearly as painful as mine has been so far! Voice Update: My voice is doing okay. It is a bit breaky here and there as I get stressed from class and work and whatever but it isn't as bad as I was thinking it might be. I must admit that I am not being good about my exercises and massage. I can't seem to get "into the groove" right now. First of all - no, this isn't a bathroom related post. Second, it isn't referring to any illegal substance. It is referring to my weekend task of repotting several of my houseplants! For several weeks now I have been intending to go purchase some new, bigger pots to transfer some of my plants into. My poor ficus has been residing in a pot which was woefully small. My Shefflera has been routinely showing its disdain for the small pot it has been living in by letting its water overflow onto our carpet. And my Christmas cactus . . . it has even gone to the lengths of dropping large portions of itself in an effort to draw attention to the fact that its roots were needing some "breathing room." So - off I headed to Home Depot with Hubby in tow. We checked out ALL of the pots and debated their various merits before finally heading home with two new pots in the back seat of my car. The need for a third pot was negated - after much discussion - by the fact that there will be a pot of the correct size available after the Shefflera is repotted. Once home I got out the potting soil and spread a layer of newspaper out on the kitchen floor so that the mess wouldn't become too extreme. Normally I repot on the back patio but it was raining so . . . it was the kitchen. First up was the Christmas cactus - or what was left of it after it showed me its displeasure by dropping half of itself onto the carpet. It is now safely (and happily, I hope) ensconced in its new pot and looking quite sharp. Skor got into the "helping" mode by making sure that the bag of potting soil was okay. I had quite a task to keep him out of the bag while trying to get dirt into the new pots. It was a bit humorous to see Skor with his white fur covered in black potting soil. Of course, Hubby wasn't too pleased with the tiny black footprints which wound their way through my music room! After the cactus I did the shefflera -- it also needed a good trim to keep it from getting too lanky. Then I scrubbed out the old Shefflera pot and the ficus got a new home as well. With all the plants safely into their new abodes, I settled down to clean up the dirt on the floor - helpfully scattered by my two adorable kitties! Even though repotting plants is a bit of work, it certainly feels good to get your hands dirty and to work with soil. I can't wait for the weather to get a bit better so I can work in my flowerbed outside. It is a good stress reliever! Voice Update: Doing fairly well. I still have some problems but the exercises are taking care of them pretty rapidly. My neck and back are too tight due to stress from my class. I really need to make an effort to get that "thumper" working so I can deal with those tight muscles before they sabotage my voice! Well, I survived another week and it is Friday. That means NO work and no place I really need to be until my haircut at 4:00! The haircut is more than a month overdue and I WILL NOT be missing it! Last night the front part of my hair - which is heavy and grows forward - was so darn annoying that I put it up in a "whale spout" just to get it out of my face! One of my friends, who called this morning, offered to pay me if I took a picture and posted it online. I don't think so! I can hardly wait until 4:00! On to happier thoughts. Have I told you that I am getting my hair cut today? Yes? Oh, well, I just don't want to forget such a happy event! Yesterday was great! I felt so light and happy. I headed to work where I realized that I had forgotten to do some things on Wednesday. Things which I really needed to do! Oops! Luckily, my bosses are all very understanding so I just did them first thing yesterday and got on with my good day! Due to the little problem, I ended up working a bit later than I had planned. I was going to stop at a nearby mall and go clothes shopping (yes, Mom, I was actually looking forward to going clothes shopping!) but, due to the later time I just headed home to Hubby. It was a good day and today is Friday! Life is good for the moment! Voice Update: Still struggling a bit due to stress causing the muscles of my neck/throat to tighten up. I have started using my "thumper" and that is helping but I really need to get this darn stress under control! I am back on track with my exercises - doing them in the car in time with classical music made me happy yesterday! It is a good morning. I am sitting here IMing with Mom, eating a brown sugar Pop Tart, and listening to my iTunes music is shuffle mode. What could be better?!? Okay, many things could be better but, for this brief second in time I feel like all is right with the world. *sigh* I am just taking a moment to soak it all in! My LONG day, Wednesday, is over and I feel like a heavy weight has slid from my shoulders. I am still really, REALLY struggling in this darn interpreting class. The teacher has a ton of very, very good information but she is a HORRIBLE teacher. Last night she verbally flogged us several times over things we had done wrong collectively as a class. One of these mistakes is that only 2 out of 12 in the class knew that we were supposed to do an assignment. Now, I ask you - if you have that kind of percentage who is clueless, just whose fault is it? I am a professional teacher, I know whose fault it is - and it isn't the students! Several times during the course of the four hour class last night I contemplated just dropping the class. It is causing so much stress in my life and just a few hours before going to class Susan told me that I needed to get rid of stress in my life because it negatively impacts my voice. There were a few brighter moments in class when I was glad I was there and was happy with deciding to take it - however, they were few and far between. So . . . now what do I do? Drop and be stress free for the time being knowing that I would have to take the class again sometime in the future or continue, get it done, and work on managing my stress better? I do have a massager I can use to help keep my muscles a bit looser despite the stress! Anyway - that was my day yesterday. This morning I woke up for the first time at 6:30 with a raging headache. I took my regular meds, ate a cheese stick, took some headache meds, and fell back in bed for another hour or so. Now - headache is gone and I am enjoying my Pop Tart and shuffle mode morning! Voice Update: Stress is a bad thing for me. The past week has been really stressful for many reasons - class and a family issue (nothing major just a little stressful) included. I haven't been very good with my exercises during this time and my voice pays the price. Susan has told me to try to get more massages while at work either from her or Maria, her colleague. I need to do that and I need to start taking my "thumper" massager to work again and using it. So many things are running a marathon in my mind . . . The good news is that my paper for class is complete - not turned in yet but complete. Hubby refused to read it (he doesn't like to read what I write because he doesn't understand the content) but, hopefully, it will pass muster with "the teacher." I also completed my other classwork which involved watching a video of another student and then completing a peer evaluation of her interpreting. This isn't the easiest thing to do in the world because you want to be critical enough that she can grow from the evaluation but you don't want to be too negative to be discouraging. Such a balancing act! Oh well! I am not thinking about class again until later this afternoon. On to more fun things. This morning I actually took the time to do some more crocheting - the first time in over two weeks. I also watched two of my recorded shows which I haven't had time to watch lately. No, I didn't walk or get additional sleep which I could certainly used but, I had a nice, relaxing time. Today I thought I would ask you what you see in this picture . . .
Oops! That isn't the right picture! That is just a darn cute picture of my kiddos taking a bit of a nap. They are both determined to nap on my favorite pink blanket! This is the picture I want to know about. What do you see? Voice Update: Still having a bit of trouble but I do have speech today so . . . I am sure that I will be "whipped into shape" in no time at all! This is going to be a short, short post because I need to get working on a paper for class tomorrow. I am not looking forward to submitting a paper to my professor because she is VERY picky about grammar, spelling, and form even though she herself can't spell (even on a PowerPoint presentation!). Voice Update: Ugh. Still having some issues but working on it. Working on it! This weekend was pretty quite. I went to the ASL lab on Saturday morning and was the only student there for most of the three hours I was there. I watched a video which made me realize just how much practice I need if I am planning on being an interpreter! Yikes! Anyway. I had fun at lab talking to the two lab assistants. We talked about television shows and about how my lovely kitty - Skor - just wouldn't let me sleep in at all that morning. Skor is well known by reputation in that lab by now! After lab I headed home to find Hubby holding a rather bedraggled African Violet. Or what was left of one. To start the story at the "real" beginning, I should tell you that when we got Skor I had two lovely, flourishing African Violets. One had purple blooms and one had white blooms. They bloomed almost constantly and were full and lush and . .. wonderful. And then . . . Skor discovered how to get onto the plant stand. The African violets were not and still aren't his main objectives on the plant stand. He is after the taller, spikier plants like my Amaryllis and Paper White plants. He enjoys batting the tall spikes around. He likes to nudge the long leaves with his head. He sits and stares at the tall greenery for long moments. Never does he bite or chew the plants. That doesn't sound too bad, does it? Well, it isn't too bad until you realize that while Skor is taking in the beauty of the plants he is seated. Seated on my African Violets! Apparently, the lovely spreading leaves of the violets makes a comfortable place to settle for a while. And, when a rather large kitty begins sitting on a plant . . . well, that plant tends to get a bit messed up. I first noticed something was wrong around Christmas time when my beautiful purple violet suddenly had leaves which were broken off. I couldn't quite put my finger on the reason though. I just kept taking off broken leaves and pondering what was going. on. Soon, the poor plant was down to only three leaves and the stem. No more purple blooms. It wasn't until a couple of weeks later that I figured out that the violet had given its life to be a kitty seat. It wasn't until Hubby noticed a big chunk of white kitty hair on the other violet which had several leaves snapped off of it. By watching vigilantly, we soon discovered Skor's plant watching habit. Trying to stop the plant sitting Hubby and I rearranged furniture trying to make the plant stand more inaccessible. We rearrange plants on the stand trying to make it impossible for a kitty to actually fit on the stand. Needless to say, we were not very successful. The white violet has been slowly paying the price of being a seat - broken leaves and a sudden lack of blooms in protest. Now we are trying to save the violet's life. I don't know if we can do it or not. Yesterday I was doctoring the violet when I decided to water my other plants. I went into my music room and noticed that my Christmas Cactus was a bit droopy. I picked up the pot and half of the plant literally just dropped off and hit the floor! Is it in sympathy for the violet? Is it because I am a bad "plant mother?" What is this plant trying to tell me? Voice Update: Well, for some unknown reason, my voice has been a bit rough lately. I have had more problems than normal with those unvoiced consonants (haven't ever heard that before, have you???). I do have an appointment on Wednesday so I am sure that I will get everything "ironed" out by then. This morning the landscape looks a lot different than it did yesterday morning (see the previous post)! After a day when the temperatures were above freezing, this is what it looks like outside. Still snow on the ground but the trees are naked again and the roads are pretty much dry. I guess this is what you get for living in Texas! Officially the snow total for Dallas was 12.5 inches! That is the most ever in a twenty-four hour period. The next closest was 12.1 inches in 1964. Yesterday was supposed to be the day that I finally got my hair cut. I missed my original appointment because of helping the office move and then waited another two weeks to reschedule. My hair is just growing and growing! However, my stylist called and cancelled because of the snow. She lives a bit north of us and said the snow is even deeper up there. Luckily, she had an appointment for next Friday so . . . I don't have to wait that much longer! Of course, by the time I actually get my hair cut I might just decide that I like it the way it is . . . . NOT! I am planning on heading to the Interpreting lab this morning to do some work. I am not sure if anyone else is going to be there to help me out. If not, I suppose I will start watching the two videos that are in the lab work. Voice Update: Well, it is still doing really well despite the fact that I didn't really do anything much in the way of exercises yesterday. I took a nap and watched some tv - not my normal routine so I "forgot" my exercises. Drat! Yesterday I was having some camera issues. Today I have those solved and managed to actually get pictures onto my blog of the amazing snow in Texas! They say that this is the most snow in one day EVER in our area making this winter one of the most snowy winters ever. And I got to be here to live through it! The bad part of all this is that the snow is really heavy, wet snow. There are many roofs and car ports, etc. which just can't take the weight and are collapsing. So far I haven't heard of anyone getting hurt but there are many cars which were crushed by falling car ports and who knows what messed up by collapsing roofs! As for myself - I am snug inside my house. I got home from work early yesterday so that I wasn't outside when the temps started to drop. They were predicting that all of the snow which cars had melted on the roads would be turning to ice and I really didn't want to be out in that! Hubby also got home early so we had a nice evening together! I have a haircut today and that is all I have planned. I was going to the DAC but the snow sort of changed my mind. I will have to go to lab for class but I am going to try to do that tomorrow. Fun, fun! Now, are you ready for some snow pictures? First some before and after pictures. This is the tree in the backyard in the morning yesterday. And this is the same tree this morning after an entire day of snow falling. My garden frog in the morning yesterday . . .
And this morning . . .
A shot of the bird feeder "before". . . The lettuce plot before . . .
And now for some general snow shots. Skor seem intrigued by the snow falling from the sky. The trees all got pretty white clothes! Some more than others . . . . The neighborhood street is a bit "messy." Remember, we don't have snow plows down here! I didn't venture to the middle of the yard where the measurement would probably be most accurate but . . . Wow! So - how did you like my REAL snow pictures??? It is almost like being back in Ohio again. Almost! Voice Update: My voice is still doing really well. I am proud that I keep at my exercises. Now I only need to keep it up for the rest of my life! Wow - that sounds a bit overwhelming when I say it that way! I woke up this morning and the first thing Hubby said was "look outside." When I headed to the window I saw a virtual winter wonderland! There was snow! True, it is wet, soggy snow but it IS snow! And more is coming down from the sky in nice fluffy flakes! This is actually the third time we had had snow this winter - it must be some kind of new record or something. Normally we get one snowfall of grainy, wet snow which covers the ground and then melts in less than 24 hours. This snow will probably melt quickly also but it is pretty. The trees are covered with snow and the flakes are beautiful in the sky. Isn't it lovely? I did take some pictures this morning with my purse camera and was heading out to take more in better light when the battery conked out. It is currently charging. In a moment of inspiration I picked up my other camera - a wonderful thing but slightly too large for my purse - and headed to the snow. Hmmmm. It must be a conspiracy because the moment I tried to focus on a lovely scene, the battery in THAT camera died! Therefore - a shocking lack of snow pictures in this blog! I am hoping that the snow is still coming down when the camera battery is charged so I can show you all how lovely it looks today. In other news . . . class last night was interesting. In non-class related events, my friend Beth was in a car accident on the way to class and her car was totalled. Luckily, Beth herself is fine (or at least she said she was last night. This morning she is probably having a few aches and pains.) but the car . . . not so much. Apparently a woman in a large, old van pulled out in front of Beth as she was driving and Beth couldn't stop before hitting her. Beth's airbag went off. Not good. We were all concerned when we heard that. The other Tricia (you did know that there was another one in my class, right?) went to pick Beth up and ended up helping with the whole mess until Beth's mom got there. Beth did make it to class. She was a bit hyped on adrenaline I would say. Class itself wasn't too bad. Still not on my top 100 list but getting better. The teacher did talk last night and there was an interpreting team to interpret everything for the deaf guy in class. It was interesting to watch them work since this is an interpreting class. I feel good about the people in class. We are all working together well (okay, not ALL of us but a group of us which seems to grow) and providing a needed sense of camaraderie! Right now I am wondering if I am going to work or not today. Hmmmmmm. Voice Update: Doing very well. I am still on track with doing exercises in the car and it is making a difference. I sound good! Of course, when I got home from class last night it had a few skips simply because I was so darn tired! What Fun! Learning a New Computer! Let me start off by saying that this post if NOT a computer instructional. If you have come here to find out anything about learning to work a new computer - sorry! That isn't what my post is going to be about. With yesterday's post I had several people cruising by to find out info on computers and I am certainly not the person to look at for that kind of stuff! Sure, I can use a computer and I can do quite a few things on them but . . . other than that - I am out. The reference in the title for today's post refers to the fact that I have started doing things on the new computer which I had done on the old computer. Uploading pictures, rearranging things, finding things in folders. All different on the new computer with the different operating software. Windows 7 seems to be working out okay right now! As you will see in just a bit - I managed to load pictures onto the computer from my camera and then to get them into blogger! That is a major victory in my book! For my class I need to upload some video to Facebook (it isn't required but it is a way for the other students to help me evaluate my video) and that isn't working out too well. Hopefully, I will get that worked out as well! It has been a while since my resident rascal, Skor, has made an appearance so . . . Here he is looking at "his" new box which Hubby thoughtfully left on the floor in the office. Of course Skor had to investigate the box - inside and out! And when I say inside - I mean INSIDE! The box wasn't quite big enough for him to get totally inside but he did try! Next is an update on my crocheting project. I am making a hot pad and my mom is making the same pattern in Ohio. Of course, my Aunt Donna (my FAVORITE Aunt Donna) had to try out the pattern. She got hers done in less than a week. What a show-off! She knits and crochets all the time so she has a bit more experience than Mom and me. Unfortunately, when the old computer crashed, it took my beginning pictures of my crochet with it. You can check some out on previous blogs. So -- what do you think? I have started on the top of the hot pad. It is all done on the grid which took me FOREVER to finish! This picture shows what I got completed the first day I started the top. I was a little enthusiastic! This shot is a bit closer up. I am proud of my progress. I actually have done more on the top but apparently I didn't get that picture on this blog. I will show you tomorrow! Well, that is it for today. I am going to try to upload those darn videos again . . . wish me luck! Voice Update: Doing well. Even Susan was surprised yesterday when she gave me a quick massage. My throat isn't too crunchy and I have been working on those exercises. I did them in the car on the way to and from work. Pat on the back, thank you very much! Well - it is Monday and my new computer is still doing well. Let's all keep our fingers crossed that this computer lasts a long, long, long time! This weekend, as I said in my last blog, was pretty well taken up with going to the ASL lab and setting up the computer. I am happy to report that all of my music made the transition. I had thought that I would lose at least some of my newly added music because I hadn't backed it up but I forgot that my iPod had the new songs AND was set to act as a data disc! That means a couple things. First, I can put data onto my iPod. I do that with some of my word documents that I want to share with my parents when I visit. Second, it means that I can actually transfer MUSIC to different itunes computers (well, not ALL itunes computers but in this case, the new computer worked well). Yeah, iPod! I was afraid for a while that I would lose my version of "The Streak!" It DID take forever (just a slight exaggeration there) to reload all the music onto the computer. I guess that is the price I pay for liking music so much! In additional news, I managed to get all of my pictures onto the new computer. When I say "all" I mean all of the pictures that I saved the last time I backed up my photos. I did lose some including the intro shots of my hot pad! Darn! I was hoping to show you the progress on that today but didn't get it done. Hopefully tomorrow! Remind me, people! It is raining proverbial cats and dogs in my neck of the woods and is chilly! In fact, I just ran to the other room to get my fingerless gloves to try to keep my hands from turning into solid chunks of ice! I bought my gloves at Target a while back and I love them! They really help when full gloves would be too much but your hands need some extra warmth around the knuckles. Plus, you can pull your fingers into the main part of the glove if you need additional warmth. Okay - I am done rambling for today. Have a good one! Voice Update: Ugh. Actually, things are going pretty well. I am slacking, major time, on my exercises though. I think someone needs to hold my feet to the fire! I do have a couple "breaks" in my voice which could be improved with exercises. So . . . "hi-ho, hi-ho, it's off to work I go!" Well, it seems like we are up and running with our new computer but I am still crossing my fingers and holding my breath. I have a lot of music and photos to transfer to this computer. Of course, when the old machine crashed I lost some (which I had neglected to back up in a timely manner! Back up people! Back up!) but most of it had been backed up a while ago. As I am typing this my computer is trying to transfer my iTunes info. Then I will have to transfer my pictures. Doesn't that sound like fun to you??? Anyway - I hope to be back to my "normal" posting schedule this week. As far as I know I don't have jury duty or any other weird thing going on so it should be a relatively "quiet"week. I spent about 7 hours in the lab at my college on Friday and Saturday getting some things video taped for class. To do the video assignments you need at least two other people to be at lab - that takes some major planning! Anyway - that phase is done. Now I need to do some heavy duty analysis of my video to see what I did right and wrong. I HATE looking at myself on video but I must so . . . onward. This morning in church our hand bell choir performed. It wasn't anything major - we had only had one practice - but it was fun. We played some pieces while the congregation was taking communion. I didn't realize how much I missed playing bells until I started again! Maybe I will manage to get some video or something of the bells in action onto my blog. We will see how that goes! I am keeping this short so I can do other things - like crochet! I have started "phase two" of the project and have made some pretty good progress! I will show you a picture tomorrow is everything is still going well then! Voice Update: Doing fairly well. The stress of the past couple of weeks has made my voice a bit worse than "normal" but I am getting back to a nice, clear speaking voice with my exercises. Well, it is Monday and . . . the computer is still not up and working. Hubby had the thing working until he tried to reload software. Apparently, the computer didn't like that too well and decided to crash and get rid of EVERYTHING (including the operating system) again. Not good! Hubby has decided to just buy a new computer and let this one crash. Now we just wait until he has researched everything and found exactly what he wants to buy. That might take a while! So - until that entire process is completed I will be working on my podcasting computer upstairs. And this computer has its own issues. Poor thing! At least it is letting me online. For now! This weekend was busy for me. On Saturday I led a SD support group meeting. Because of my lovely sedate life lately (read that with about 2 tons of sarcasm, if you will! ), I neglected to get the notice for the meeting out in a timely manner so not too many people attended the meeting. Including me there were six of us. However, it worked out well. We got to chat and the one new woman said that she really enjoyed the meeting so . . . it went well. I didn't have my normal preparations completed because they are usually done on my computer and we all know how the computer is doing lately! Grocery shopping was also on my "to-do" list for the weekend. Luckily, I had made the major "meat run" trip last weekend so this one was a light shopping trip. Unfortunately, it wasn't an easy trip because Sunday is the day when the store restocks and that means that there is someone in nearly every aisle with a HUGE stack of boxes which is nearly impossible to circumvent with a shopping cart. Add other shoppers going the opposite way down the aisle and you have quite an adventure! After grocery shopping I headed to church to partake in hand bell practice. I haven't played hand bells for several years but recently the leadership has changed and so I thought I would give it a shot! Music is something I really enjoy and so hand bells was fun. The people are friendly and the ringing is fun. I think I will keep it up for a while. We will see how it goes. Right now it actually fits into my schedule but there was some talk of moving practices to Wednesday nights. If that happens I won't be able to attend. This would be where I might mention my interpreting class. However, I am still not in a mental place where I can talk about it objectively so . . . I decline to comment! When I got home from hand bells, Hubby had dinner in the oven (he is soooo sweet that way). We had baked stuffed shells (which we buy from Sam's Club already stuffed), English Muffins and fruit. Yummy. Then we headed to Wal Mart. I decided to make a "care package" for my friend, Beth, who is in college. Since I don't have any children who will be heading to college, this is my chance! I loaded up on "dorm food" which can be microwaved and doesn't need to be refrigerated. Hubby contributed peanut butter and jelly - he says no college dorm room should be without it. That is the extent of my exciting weekend. I hope your weekend was just as exciting - or more so! Oh - I almost forgot! I am finished with the "grid" section of my crocheting project. I am making a grid hot pad and you make a grid first (you may have seen some pictures while I was working on that part) and then you fill in the grid. I am not too sure how to get started on filling in the grid but . . .I always appreciate a challenge. When we get a new computer I will make sure to show you some pictures of my work! Voice Update: Still really struggling. The people at the support group said it was great (and one guy continued to insist that I didn't have SD at all - what a dork!) but I was really having problems later in the day and on Sunday. My voice always seems better in the mornings and then gets weaker in the evenings. Several people at the support group said their voices are just the opposite. It is interesting how SD can be so individualized.